I wrote this list of recommended political movies on Netflix (Ireland) for Broadsheet, it appeared online on August 16th. It was a follow up to my earlier Summer Political Reading list, which ran on Broadsheet on July 31, 2017 – see here. I will repost this book list on here shortly. A few weeks back I offered you my suggested Summer political reading list, today I propose an accompanying political movie viewing list. The movies below all have the benefit of being available on the Irish Netflix service, but they can also be viewed elsewhere. By the way, one of the authors featured in my political books list, Chris Patton, will be talking with John Bowman as part of Dublin City Council’s Dublin Festival of History on September 30th. This is an absorbing account of the rivalry, if not visceral hatred, between US writers and commentators Gore Vidal and William F Buckley. Their stores are told through their participation in a series of televised appearance during the 1968 Democrat and Republican conventions. Rather than just show the conventions live, the US TV network CBS had elected, mainly due to costs, to invite both men, Vidal the darling of the liberal set and Buckley the arch conservative, on to debate each other and comment on that night’s convention proceedings. While surfing the internet I came across this little nugget: Lyndon Baines Johnson’s “Rules of Life”. The ebullient LBJ was a larger than life character who contemporaries described as highly driven, ambitious and devoid of any interests or past-times outside politics. 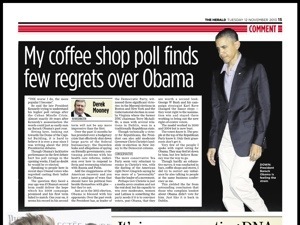 My column for The Herald from Washington DC on my “coffee shop” poll one year on from President Barack Obama’s second term win. “The worse I do, the more popular I become”. So said the late President Kennedy trying to understand his higher poll ratings after the Cuban Missile Crisis. Almost exactly 50 years after Kennedy’s assasssination the words could just as easily sum up Barack Obama’s past year. Sitting here, looking out from my Washington DC hotel bedroom towards the Dome of the Capitol building; it is hard to believe it is over a year since I was writing about the 2012 Presidential debates. Though his lack lustre performancein the first debate hurt his poll ratings in the opening weeks, I had no doubt he would be re-elected. The real question one year ago was if Obama’s second term could deliver the hope and promise which his 2008 campaign promised and his first term failed to match. One year on, it seems that his record in his second term will not be any more impressive than his record in the first. Over the past 12 months he has presided over a budgetary crisis that effectively shut down large parts of the federal bureaucracy; the Snowden leaks and allegations of spying on friendly governments; continuing problems with his health care reforms, indecision over how to respond to the Syrian crisis and worsening relations with Russia and Putin. Add the sluggishness of the American recovery and you have a catalogue of woes that should have his political foes beside themselves with glee – but they’re not. Just as in the 2012 election: Obama is blessed with his opponents. Over the past week the President has, as leader of the Democratic Party, witnessed three significant victories: in the Mayoral elections in Boston and New York and the Gubernatorial election in nearby Virginia where the former DNC Chairman Terry McAuliffe, a man with several relations in Dublin, won in a traditionally Republican State. Though techically a victory for the Republic Party, the President can also add moderate Governor Chris Christie’s landslide re-election in New Jersey to the Democrat column. The more conservative “tea party” republicans seem very reluctant to rejoice in Christie’s win, with the darling of the American right Newt Gingrich saying that he was more of a “personality” leader rather than the leader of a movement. Maybe he is right. Perhaps Gov Christie is just media savvy creation and not the real deal, but his capacity to win over moderates, women and Latinos is something the Republican Party needs if it is to convince voters, post Obama, that they are worth a second look. For decades before George W Bush presidential elections were fought on the basis of the Democrat lurching to the left to win the nomination but steering back to the centre to win the election itself and the Republican doing likewise, only to the right first,then back to the centre. Bush and his campaign stratagust Karl Rove changed that – they went right towin the nomination and then stayed there working on bring out new right of centre voters. The model worked in 2000 and 2004, but is now bust. The voters know it. The people at the top of the Republican Party know it. Only their grassroots don’t get it. Very few of the people I spoke with over the past few days here in Washington DC and in neighbouring Virginia, regret voting for Obama. They may feel let down by the President, but almost none believe that Romney was the way to go. Though hardly an exhaustive or scientic survey. To be frank it was conducted mainly in bars, coffee shops and stores. I did try to correct any imbalance in the sample due to my social habits by also talking to people attending the same business conference as me. Those interviews yielded the far from astounding conclusion that those who complain most loudly about Obama, never voted for him. Just like it is back in Dublin. With the council elections due next May local political organisations will soon make final decisions as to which of their aspiring candidates will make it on to the ballot paper. Given the time and energy many of them have already put in to proving that they can get elected, it is tough to see willing and able people rejected, but politics is a tough business. Unfortunately most new candidates, just like most new businesses, fail. Only a few ever make it to the national stage. Predicting who will is more a dark art than a science. From my experience of running campaigns the key predictor of success is not passion or commitment, its obsession… and I don’t mean the fragrance. 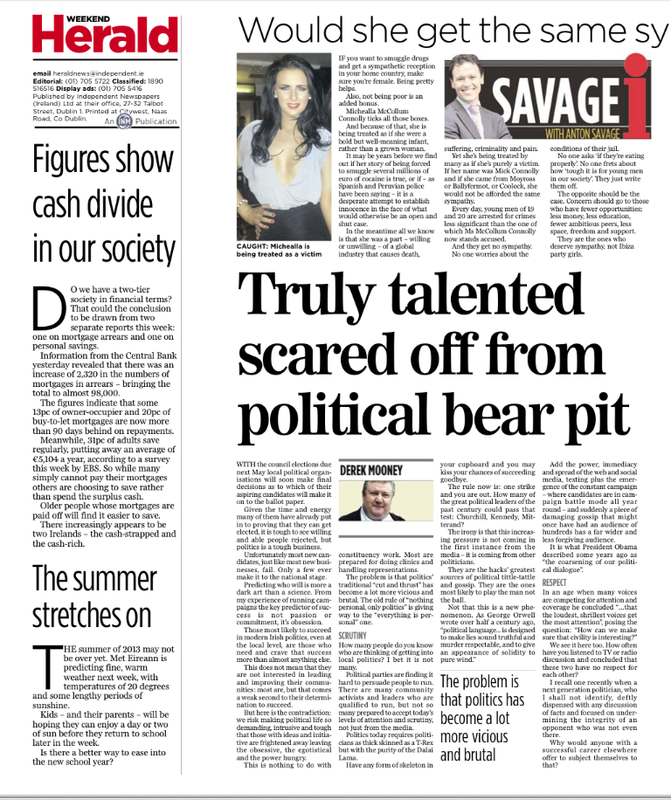 Those most likely to succeed in modern Irish politics, even at the local level, are those who need and crave that success more than almost anything else. This does not mean that they are not interested in leading and improving their communities: most are, but that comes a weak second to their determination to succeed. But here is the contradiction: we risk making political life so demanding, intrusive and tough that those with ideas and initiative are frightened away leaving the obsessive, the egotistical and the power hungry. This is nothing to do with constituency work. Most are prepared for doing clinics and handling representations. The problem is that politics’ traditional “cut and thrust” has become a lot more vicious and brutal. The old rule of “nothing personal, only politics” is giving way to the “everything is personal” one. How many people do you know who are thinking of getting into local politics? I bet it is not many. Political parties are finding it hard to persuade people to run. There are many community activists and leaders who are qualified to run, but not so many prepared to accept today’s levels of attention and scrutiny, not just from the media. Politics today requires politicians as thick skinned as a T-Rex but with the purity of the Dalai Lama. Have any form of skeleton in your cupboard and you may kiss your chances of succeeding goodbye. The rule now is: one strike and you are out. How many of the great political leaders of the past century could pass that test: Churchill, Kennedy, Mitterand? The irony is that this increasing pressure is not coming in the first instance from the media – it is coming from other politicians. They are the hacks greatest sources of political tittle-tattle and gossip. They are the ones most likely to play the man not the ball. Add the power, immediacy and spread of the web and social media, texting plus the emergence of the constant campaign – where candidates are in campaign battle mode all year round – and suddenly a piece of damaging gossip that might once have had an audience of hundreds has a far wider and less forgiving audience. We see it here too. How often have you listened to TV or radio discussion and concluded that these two have no respect for each other? I recall one recently when a next generation politician, who I shall not identify, deftly dispensed with any discussion of facts or and focused on undermining the integrity of an opponent who was not even there. Why would anyone who either with a successful career elsewhere offer to subject themselves to that?